Suitable for: Early Years/ Early Childhood Centre coordinators or Head of Pre-school, teachers in Pre-schools and Early Years centres. Kindergarten Teachers. 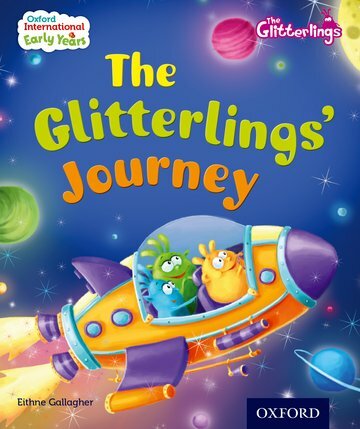 The second of nine exciting stories, The Glitterlings' Journey tells of Glot, Flitter and Ling a Ling who travel to earth to meet Messy Tessy. Story Time audio CD included with space on each page to write words from other languages. Children, parents and teachers will love these beautifully illustrated stories. School to home story books can be used to help young learners connect English language in the classroom with their home languages. Story books present nine themed topic units in a fun, colourful and engaging way. Offers a match to the respected UK Early Years Foundation Stage framework used around the world (EYFS). Meets the needs of both ESL and E1L students who are emergent bilinguals within English language Early Years settings. Supports ESL teachers in the challenge of delivering an English literacy programme. Offers guidance and classroom management advice on EYFS and Interlingual Teaching. Gives the teacher the tools for observation and assessment of student learning and tracking progress over the year in readiness for Primary school. Provides a simple but strong connection between student, teacher and parent in a 'home-school learning link'.